It looks like my one week off became a bit extended, didn’t it? Well, to those in the United States, I hope you had a wonderful Thanksgiving holiday. Today I’d like to discuss what is for me another major component of the Avalonian tradition: healing. As discussed here in August, this path is clearly a mystery tradition. But it is a mystery tradition that has always been focused on healing. Many other Avalonian groups do focus on this. Jhenah Telyndru’s book Avalon Within is an indepth plan for self-healing and self-awareness. Many other books and groups also incorporate healing the self as preparation for the work of a priest or priestess. However, not much is talked about healing beyond that. The stories of Arthur and Avalon make it clear that healing is an important aspect of the Isle. First, Arthur is taken to Avalon to be healed. It is up to the individual reader to determine whether the wounds being healed are physical or spiritual (though I lean toward the latter since Arthur is mortally wounded. Further, Morgan is described as skilled in healing arts. And a key quest to many of the Arthurian romances is the healing of the Wasteland by healing the wounds of the Fisher King. I truly believe this is best done as a progression. Healing the self is key to having the strength of mind, body, and spirit to accomplish the other two. And healing other people in your community — whether helping them become physically fit, spiritually grounded, or aware and educated about important issues — makes the quest of healing the Wasteland much more attainable. Healing is an extensive subject, so we will spending the next several weeks focusing on this progression of healing and a few techniques for doing each. Due to a trip for work (and preparing for it), there probably won’t be any posts this week. I might be able to on Friday or Sunday, but no promises. If not, I’ll be back next week with a couple posts focused on the Avalonian tradition as a path of healing. Many of you probably already know which herb the headline refers to – the wonderful and fragrant rosemary. But you may be wondering why I’m still talking about Samhain. First, many modern Druids and Pagans do not consider November 1 to be the true date of Samhain and often honor it and (other holy days) on its astrological date, which is Nov. 7. Also, my hearth doesn’t typically approach the holy days as a single day, but more as a season. We see the holy day as simply the marker to adjust to the particular season. So I may delve into Samhain topics – from honoring the dead to introspection – throughout November. Rosemary is easily my favorite herb. From baking and hair rinses to healing and purification, rosemary is incredibly versatile. Sprigs of the evergreen perennial was often tossed into graves to say that the mourners would not forget the deceased. In ancient Greece, students would wear garlands of the herb while studying because they thought it would help them remember better. In recent years, studies about aromatherapy have indicated rosemary’s chemical properties do improve cognitive performance, which supports this bit of folklore (for more information, check out the studies links in the Sources section). In regard to Samhain, remembrance is the herbal association that springs to mind. For many years, I have baked Remembrance Cookies, which are simply sugar cookies with fresh chopped rosemary added in and cut in the shape of men and women (like gingerbread man cookie cutters), as a part of celebrating Samhain. The idea is for all present to take a cookie and, while eating it, remember the loved ones they have lost as well as their ancestors. Of course, some of the cookies are left out for the spirits. During the Dark Ages, the herb was burned to deter the black death. And in WWII hospitals in France, it was burned with juniper berries to kill germs. This might sound like crazy talk in today’s world, but according to Rodale’s Illustrated Encyclopedia of Herbs, studies have shown rosemary to have antibacterial properties. Also, the oil in the leaves and flowers is officially listed in the U.S. Pharmacopoeia. Other healing properties, according to the lore, includes use as an astringent, diaphoretic, expectorant, and much more. It has been thought helpful for depression, headaches, and muscle spasms. As an ointment, it was thought to help rheumatism, sores, eczema, and wounds. These, however, have not been confirmed by research (to my knowledge). It can even help your beauty regimen. A bath with rosemary can stimulate circulation (though take care if using essential oils – it is easy to put in too much), and a hair rinse of rosemary and water is great for brunettes. Rosemary also has a long history connected to Christian myth. 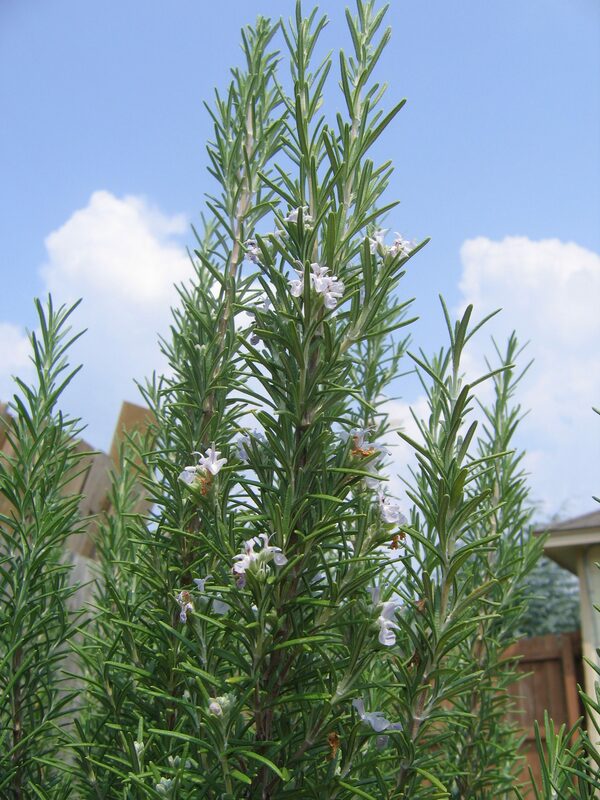 It is believed rosemary will not grow taller than six feet so not to grow taller than Jesus. According to legend, the plant’s flowers changed from white to blue when the Virgin Mary hung her cloak on a rosemary bush when she was escaping from Herod’s soldiers. Yet several spells for prophetic dreams using rosemary wands have a connection to Mary Magdalene instead. Where Rosemary flourished, the woman ruled. Other magical associations are love, lust, mental powers, exorcism, sleep, and youth. Indeed, rosemary is part of various spells for engagement, fidelity, happy marriages, love, success, and empowerment. Simpler uses include placing it beneath a pillow to promote a good night’s sleep or beneath the bed it protects the sleeper from harm. Frankly, I’m just touching on the considerable lore and information about this herb. If your interest is piqued, you can find much more information. Easy to grow, this herb loves a sunny spot with somewhat alkaline soil (if your soil is acidic, add wood ashes or crushed eggshells to the soil). Seeds are difficult to start, so cuttings are the best choice when adding rosemary to your garden. However, it doesn’t like extremely cold weather, so it may not be hardy in northern climates. It can be grown in containers and brought in during the winter; however, take care not to overwater it – and it would appreciate misting. If you’ve never considered rosemary in your garden before, I hope you give it a try. No other herb in my yard sees my garden snips more!